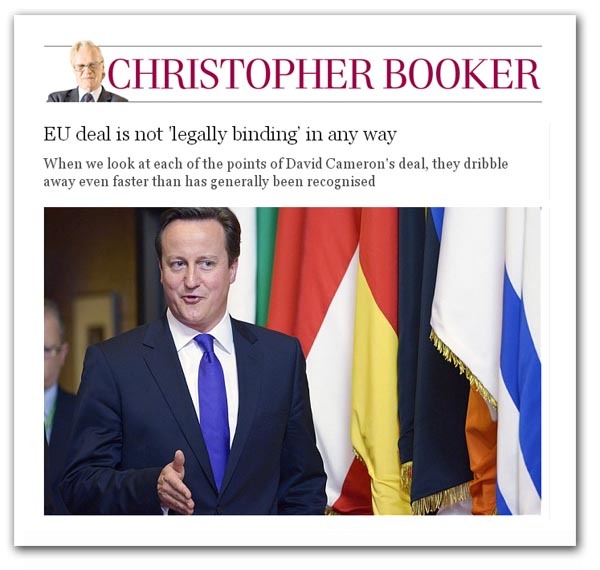 Following on from the great Tusk proposal, Booker enters the fray to declare that the "deal" is not binding in any way. For the first time in the legacy media, we also see a reference to the so-called "emergency brake" stemming from articles 112 and 113 of the EEA Agreement, allowing the inference that Mr Cameron or his predecessors could have invoked this provision without going through the pretence of a "renegotiation". If there was any way Parliament was doing its job, these issues would have been all over the newspapers this weekend, with a constitutional crisis in the making after the Prime Minister had been called out for lying to the House of Commons. But, it would seem, a Prime Minister telling lies to the Commons is now part of the natural order of things. MPs don't care and it is not deemed worthy of any comment by the legacy media. Never more, therefore, has it been so clear that our democracy is broken. None of us ever thought it would end this way, not with a bang but with a whimper. Leaving the EU – if it ever happens – can only be the start. If it isn't, there's little point in leaving.